A website is a storefront for customers to search out information about a company, it’s truly window shopping. Obviously, sales would increase if a salesperson was in the store to answer questions, offer suggestions and assist the customer. With WaveAccess ChatOnline, your website can have a salesperson manning the store. A tool to allow you to communicate with your website visitors while they’re still on your website! 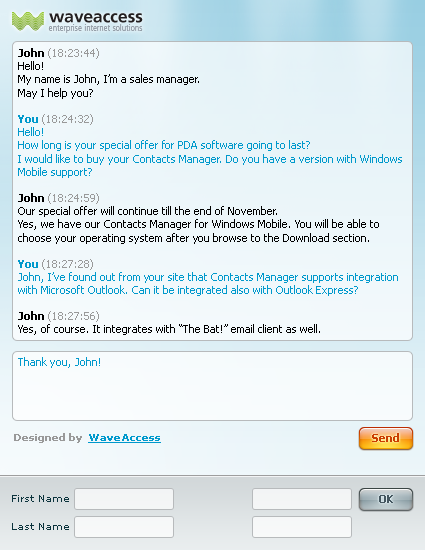 Using WaveAccess' ChatOnline will increase your sales from the day you install it! Website visitors are looking for information. If they can’t find what they want in a short time, they leave. Website navigation is important, just like aisles are critical in a department store, but can you imagine a department store with no salespeople? Give your customers the information they want when they want it. Hope is not a strategy, so stop hoping they will get the right information by reading uploaded documents, requesting an e-mail, or filling out a contact form. With WaveAccess' ChatOnline, your customers can get the answers and you can get the sale, right now! People come to the site, quietly browse it – and then they leave! Without even asking additional questions through phone or e-mail! ChatOnline – a salesperson for your site! Now – what changes if the store hires a salesperson? Everyone who comes in is tended to by the salesperson. Even if you have higher prices than your competitors – even in this case – you have a good chance to sell your goods to the customer. Sales people with even the most basic selling skills – kick up sales. Assuming this is a good salesperson – the sales may double, even triple etc. We created an online salesperson tool for your site. Most sites have a huge void, no sales people! And that’s why they don’t sell as much as they could. The visitor answers your leading question and in the same instant another chat window pops up on the store side – where your live salesperson can see that a new customer wants to talk. After that, your salesperson is chatting with the visitor and following whatever selling strategy you use. 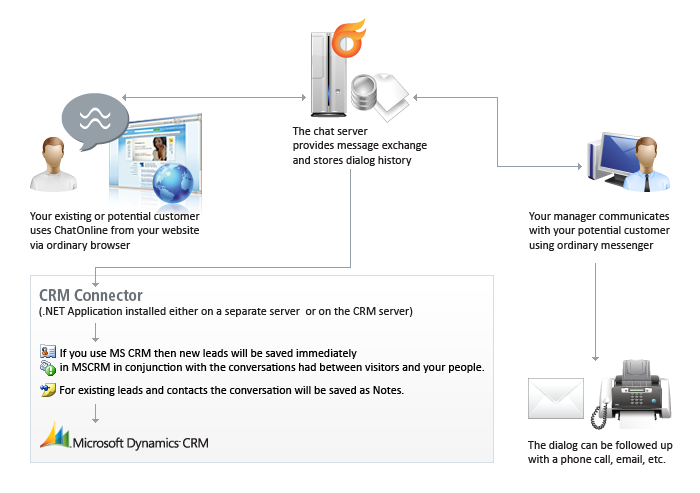 If you use Microsoft Dynamics CRM, new leads will be saved immediately in your CRM in conjunction with the conversations had between visitors and your people. For existing leads and contacts, the conversation will be saved as Notes. You can take the contact information and then use direct marketing to reach them. Or, you can propose to continue the discussion over the phone. You have a variety of choices because you’re already talking to a potential customer. You may say: “Ok, I already put my phone number and my e-mail on my site – isn’t it enough?” No, it’s not. People visiting sites usually do not call. They browse the site – and then they go to a competitor's site. Putting your phone number and e-mail on the site, you assume that a visitor will initiate the conversation. Seldom does the customer make the first call. But you can initiate it yourself! You may invest in copywriting services in order to create selling texts and images on your site. But, it will still have lower success rates than live conversation with a live salesperson. And, by the way, how many people can a salesperson talk on the phone with simultaneously? One, right? With WaveAccess' ChatOnline, the salesperson can chat with 10 people at the same time. Now, that’s efficient! This is a real Revolution in Internet Sales. You can have it instantly! If you decided to significantly increase your sales right now by adding this service to your site – it will cost $249 for the first 5 salespersons plus $99 for every additional 5 salespersons who use it. We take care of everything: training and installation. Worried about time? We’ll have you up and running and trained in two days. That means you can start using WaveAccess' ChatOnline service almost immediately. We provide a three-month warranty on our tool – that means full support and delivering patches once they’re released. After this period, the support will cost you only $30 per month per 5 salespersons. Assume you have 100 visitors on your site every day. And you sell something that costs $1,000 on average (for instance, travel certificates). Every day you have 3 calls from your site's visitors to your office and one of them buys. Assume your net income is 10% – that means you get $100 of net income every day or $3,000 monthly. Now, you install ChatOnline. It costs you $249. You ask your assistant who sits on the phone to be responsible for the chatting, too. The assistant becomes a salesperson. Now you manage to talk to 10 visitors on your site every day. And you start selling 2 additional certificates daily. This means $200 of increased daily net income or an additional $6,000 net income monthly. You get an additional $6,000 monthly for a one time investment of $249! The great thing about ChatOnline is: it can be used everywhere. Really, it can be applied to any industry – travel agencies, internet shops, consulting, realty, construction – everywhere! It can be used with any number of visitors on the site. If there are few of them – you’ll be able to contact almost every visitor on your site directly. If there are a lot of the visitors – you’ll be able to talk to 10+ people simultaneously – you’ll still directly contact huge number of customers. This is amazing! Independent of what industry you are in, independent of number of visitors on you site, WaveAccess' ChatOnline will be significantly increasing your sales.